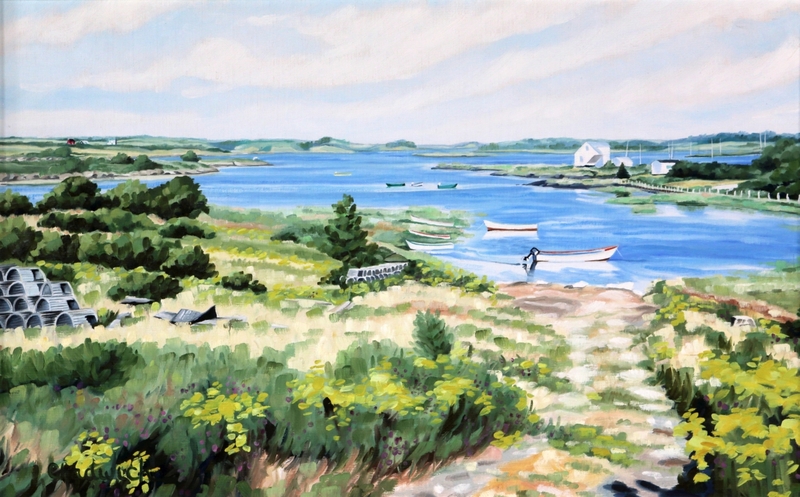 Phil Chadwick's Art: #0108 "Summer in Lunenburg Harbour"
#0108 "Summer in Lunenburg Harbour"
This is one of the bays in Lunenburg Harbour, Nova Scotia during the summer of 1981. The cirrostratus was coming at us and the fair weather was not going to last. 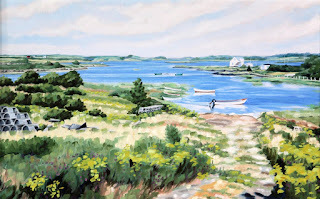 Nova Scotia is one of those truly beautiful places with fresh paintings to be found around every corner. We loved the place and the people and the weather. I learned a lot of meteorology from those skies. The concept of three dimensional vorticity swirls and pervasive deformation came from those clouds although it took me several years to put those fluid dynamics into terms that I could teach. I tried my very best in my Studio under the basement stairs. The few strokes required to paint the outboard motor on the small boat where fun. The kids were typically playing around me in my cramped quarters. My Dad really enjoyed this painting.